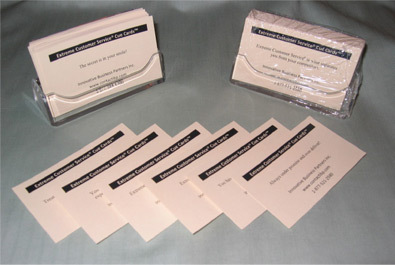 Extreme Customer Service® Cue Cards A distinctive set of Joe’s 52 motivational cards complete with desk top holder! This set of Joe’s 52 favorite quotes, one for each week of the year, serves as a constant reminder that “Extreme Customer Service®” is what truly separates you from your competitors. Each set comes with a desk top holder and is shrink wrapped for easy handling. “Creative Sales and Marketing ™” and “Team Building for Success™”. To order your Cue Cards today call 1-877-521-2580 or download the order form below. “ Your various programs on Team Building have brought our people together and they work better together and the measurement is how we have improved in our extreme customer service (with regards to how our staff serves each other and our customers)”.